Hard rock exclusive use, the iso (ROCK) fastest machine appeared. Hard rock dedicated machine with Hyper Digi gear. With the unprecedented rigidity, it is equipped with the fastest engine in HRF history. Do not let the target fall under the root. All CRBB specification. The biggest merit that Daiwa's waterproof and durable technology "Magshield Ball Bearing" brings is to remarkably eliminate rust and noise of ball bearings and to maintain initial performance over a long period of time. Not limited to reel, approximately every ball bearing is used for a certain period, the rotation performance deteriorates due to wear of the ball. However, conventional reel ball bearings often failed to be used due to salt garbage and rust before the ball worn. This changes completely with the mug shield. Even without maintenance, ball bearings will be able to fulfill "original life expectancy". In addition, since the mug shield ball bearing is a non-contact structure in which a mild oil fills a slight clearance between the inner ring and the electrode plate, the rotational resistance is originally very small. When compared to bearings using rubber packing inside for waterproofing, the difference in their rotational feel is clear. Smooth rotation with zero friction zero is kept surprisingly long without special care. It goes without saying how epauque this is. T shape shape level wind turns back and forth half turn according to clutch ON ・ OFF. During casting, the level wind rotates forward, and the line is smoothly discharged through the wide part of the T shape level wind. At the time of retrieving, the level wind turns half way in the form of falling in the backward direction, the line is guided in the groove of the lower level wind, and it is wound tightly and in parallel. 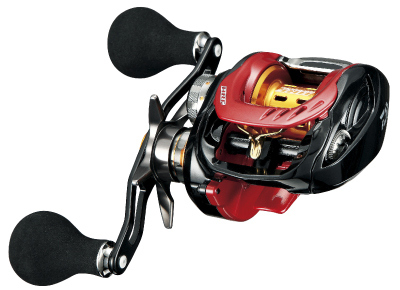 Daiwa's unique level winding system that combines line emission performance and trouble free.